I'll not tell you the date, but based upon a very few simple and well-grounded assumptions, it will fall in the year 2027. "E-Day" is the day that all government in America will evaporate because, having gained a proper understanding of its nature, nobody will be willing any longer to work for it on any terms; tens of millions will have done what a certain DMV employee did in 2022. Here's what happened, on that day. The few remaining useful government functions had ceased to operate and had been taken over fully by free enterprise at far greater efficiency; and then the very last operation of any government in America came to a halt for want of employees. The arrogant manipulators who imagined someone had given them the right to live at someone else's expense were left with nobody to carry out their instructions; they had no choice but to quit too, and many of them left the country, not wishing to live in a free society where they would have no elevated status - though some had quietly changed their dollars into gold and took it with them, just as some top Nazis had squirreled away gold and diamonds in 1945. Now, the Age of Government ended, and nobody heard even a whimper. It remained only for the rest of the world to catch up. 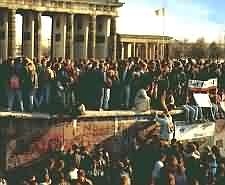 It was peaceful, in that there were no riots of the kind that normally accompany revolutions - even the relatively peaceful Russian one of 1990. The only significant violence was by habitually violent criminals who had been set loose from the Nation's prisons in recent weeks, when all the remaining guards walked off the job. Josiah Browne, a caretaker in the otherwise deserted IRS headquarters in Washington, DC, placed his keys on the reception desk, pulled the master switch for the building's lights, and walked out of the open door onto Pennsylvania Avenue, having lowered the Stars & Stripes from the flag poles there a few minutes earlier. He was the last known government employee in America to walk off the job. Josiah was not the brightest star in his family's firmament, but steady reliable service for government in humble occupations had led him in due course to serve the Revenuers, and he had done that with pride for thirteen years. All the Brownes attended church every Sunday, and in a city renowned for a high crime rate even outside its government buildings, they led an upright life and Josiah had raised his children not to steal or cheat, not to bully their schoolmates, and to obey the law. Josiah didn't read too well, but in recent months he had become gradually more concerned by reports that reached him on the 'grapevine' that the men and women he cared for every weekday might be breaking some of those very principles. During 2026 and particularly 2027, he had noticed that an increasing number of those fellow employees, who wore smart suits and usually came and went swiftly with their briefcases, weren't around any more. Several of the 'suits' had become friendly with Josiah, for he was a simple and friendly soul who would occasionally run them errands, and they would exchange pleasantries when passing through the lobby. One was Greb de Monay, the graying former revenue agent who had been pilloried decades earlier by Irwin Schiff, the pioneer of tax-law research, when Greb was a young hotshot, a rising star. One evening, Greb stopped by and shared with Josiah the news that he too was leaving the Service. He said he had come to realize that all his working life, he had been trying to enforce laws that did not exist, and which would have been utterly immoral even if they had existed, and felt very bad about it. He also said he'd been learning about the real nature of government, and wanted to end his days putting right some of the damage he had caused. Josiah related this story back home next weekend while his brother's family was visiting, and nephew Caleb - who had a neat job in IT for a shipping company in Baltimore - told him Greb had been exactly right, and asked whether his uncle had joined one of the freedom schools yet. Not so, for Josiah's computer skills were limited to gaming, so Caleb invited him to join one and showed him how to work it. So with a fair bit of help from the nephew, the uncle worked his way through TOLFA, and after three months he had just about got it. He then realized - as Greb had done - that he had been working for the wrong master; that all the precepts he had taught his children were being violated by his employer all over the floor. And so, without knowing whom he would work for next, he resolved to quit; and on E-Day, he put that resolve into action. What he could not have known beforehand was that he was the very last employee to do so. The Internal Revenue Service had never been of 'service' to anyone except the government that set it up, so when Josiah walked out on that historic evening, nobody grieved. He had hardly walked a block, however, when he noticed fireworks over the National Mall. He decided to check them out, and called his wife April to meet him, to meander around and join the party. It was an amazing sight, which others compared to the German celebrations 38 years earlier. There was no centrally choreographed display; rather, single individuals and families and quite often company managers had brought boxes of fireworks bought outside D.C., and lit them up in areas they picked on the grass or near one of the monuments. Not far from the Capitol steps there was a bonfire, and what seemed like relays of pickup trucks and SUVs brought more and more papers to pile upon it. Josiah asked about those, and was told by people with very happy faces that they were some of the files they had been working on in the Justice Department, the DHS, the DEA and the FBI and several other components of the former government's alphabet soup. The paper burners were all celebrating the destruction of some outrageous violations of privacy of innocent people. Up and down the 2-mile long Mall there were some bands here and there, with makeshift stages, and nearby each people were dancing. There weren't picnics, as such, for the evening was chilly - but there were several hot-dog stands to be seen, and that was the first time many had ventured near the Mall since the DC Peddlers' Law had confined them to other streets. They were being very well patronized - as were the stalls set up with beer kegs and marijuana joints, both far more illegal yet. Everyone was having a good time, for none of those ridiculous laws now had any teeth whatever. The only disappointment of the evening was felt by the retailers of pot; they were able to sell the product only at prices lower than what they had paid for it during the preceding couple of weeks. The drug-price decline which began when juries had refused to convict in drug trials, tipped over the edge this week; marijuana commanded a price little higher than tobacco, now of course free of all tax. Groups had been busy at the monuments. Only Jefferson's, across the water, was left pretty well unscathed - but the others were enhanced with suitable graffiti, including the old familiar Humpty Dumpty outline, though now he was wearing a grin from ear to ear--because now there were no longer any "King's Men" to even try to put him together again. Those had hitherto been kept away from these most sacred icons of government by special teams of round-the-clock police "vandal" patrols. Painters were busy too at the Washington Monument, and Josiah and April saw taking shape on one of its sides his famous quote, 'Government is not reason, it is force; and force, like fire, is a dangerous servant and a fearsome master.' There were additions in smaller letters and different colors, to the effect that old George, like all the others, knew the truth but operated a government anyhow. Perhaps the most telling graffiti were sprayed around the statue of FD Roosevelt, in his half-concealed wheelchair. In various ways, they expressed the accurate perception that this insanely ambitious cripple had crippled a whole economy for twelve years and caused the slaughter of four hundred thousand Americans, blighted the lives of a million families, deprived three generations of retired people of the living standards they would have enjoyed absent the grotesquely mis-named 'Social Security' system, and laid the foundations for a truly massive growth in government. These were all sobering truths, and many more would be added in the weeks following. But the prevailing atmosphere on E-Day was of gaiety and relief and joy and optimism, more than recrimination about the savagery of dead politicians. Not too many splashed in the Reflecting Pool, but there were speakers in the spot where MLK had spoken of his famous 'dream' so many years earlier, and April and Josiah listened there for a while and realized that at long last, that dream had been fulfilled before their very eyes. Strolling back beside the pool, April and Josiah were passed by half a dozen evidently deep in conference, three of them in uniform--though those each dangled a 'peace sign' medal on a breast pocket. Some of what they said could be overheard. 'The thing is the world's largest white elephant,' said one, 'I can see no use for it at all.' 'Hold on,' replied another, 'that's for the market to decide. Just because we can't put 3.7 million square feet of office space to good use doesn't mean that nobody else can. I say we just form the company and claim the title. Nobody else wants it, so there shouldn't be any quit-claim settlements to pay.' 'I agree,' said a third. 'Heck, it's right by a marina, some of it could be remodeled into a resort!' 'Harrumph.' retorted the first. ''Desirable rabbit warren with 17 miles of corridor, convenient to downtown D.C., for sale or rent'' and the six dissolved in laughter. As the group continued past the Brownes, Josiah realized they had been speaking of the Pentagon. How amazing, he thought to himself. The nerve center of history's mightiest military machine, being put somehow to good use. "Amen," he said to April, and quoted Micah 4:3 out loud: "they shall beat their swords into plowshares, and their spears into pruning hooks: nation shall not lift up a sword against nation, neither shall they learn war any more." Tailgate stalls opened around the Mall offering free-market liquor, the first of their kind for over a century. One of them was spectacular: the White House Sommelier had 'liberated' a good deal of the presidential cellar and was offering as much of it as he could pack into his pickup to any who would buy, with proceeds going to charity - notably, to the several that been recently formed to help those devastated by government action. He quickly attracted buyers, and ran an auction (illegally, of course, since he wasn't licensed as an auctioneer; but everyone knew that no laws were any longer enforceable.) The prices were amazing! Each bottle or case came with a provenance to certify its origin in the cellar of the last US President in history, and one case of 2015 Chateau Margaux fetched 350 gold grams! The Sommelier didn't know, but the buyer later sold it again for 750 gg, and donated half his profit to charity also. I cannot tell you if that wine was ever actually drunk, but it did do a heap of good. Such prices were way beyond the Brownes' means, so they just passed by the tailgates with interest. In any case, aside from a little wine on special occasions and a sip of Benedictine on birthdays, they didn't drink. Another type of stall was found around the Mall, marked by 'HELP WANTED' posters; and there were lines of ex-government workers forming. Josiah had not made much of a plan for the future when he had walked out, for the last time, of what was widely known as Gestapo Headquarters. He didn't have many skills, but thanks to his recent studies, he did have a new and healthy understanding of which way was up, and he was a willing worker, so he lingered a while at each he passed, in case there might be a job to suit him. One in particular caught his eye; a couple were recruiting on behalf of one of the charities that had arisen to help those in need. This one was the Society to Assist Victims of Government, or SAVOG, and they needed some support staff for their new office following receipt recently of several generous benefactions. Josiah introduced himself, and was amazed to learn that SAVOG planned to move into some of the ground floor offices at 10th St. & Pennsylvania Ave., NW - the very building he had just left! The charity felt there could be no more suitable place to set up their offices than where so much devastation had been caused to so many victims of government--the former IRS Headquarters; and since nobody held a valid title to it, the premises were there for anyone to take, without rental. But of course, staff would be needed to maintain the building. Josiah was a perfect fit, and he was hired on the spot - to do basically what he had been doing for several years past. He and April were really pleased they had decided to join the fireworks party! Later on, in that job, his colleagues discovered that he had been the very last government employee to quit, and after he had borne his share of teasing, the news reached a TV company and he was interviewed for nationwide syndication and even overseas sales, for a royalty that more than made up what he'd lost in the form of lower wages. April and Josiah left the party at 10 p.m., though it continued into the small hours - indeed, spontaneous parties took place for the rest of the week, all over the country, as broadcasters from the world over reported that not a single function of government anywhere at any level was functioning any more, and so everyone realized that the day for which they had learned to prepare had at last arrived--the day when each one took his or her life back, liberated at last to live it his own way. It was the most significant single day in thousands of years of human history. In cities and towns from sea to shining sea, joy knew no bounds as FREEDOM was celebrated! An account of the next, busy, exciting three years is given in my book "A Vision of Liberty", but now mankind's long, disastrous subjection to the totally irrational institution of government had, in the first of what was to become every country in the world during the next decade and a half, come to an end. The new era had begun, and the human race was about to experience progress beyond all previous imagining.